The Yamaha MusicCast Bar 400 is a solid 2.1-channel soundbar, that sounds great with movies and music. The inclusion of DTS Virtual:X helps create a more immersive experience, while MusicCast multiroom is a really useful feature. However, the lack of support for Dolby Atmos and DTS:X puts this particular combo at a disadvantage compared to some of the competition. The Yamaha MusicCast Bar 400 (YAS-408) is a 2.1-channel soundbar with an included active wireless subwoofer. It includes DTS Virtual:X and, as the name might suggest, the manufacturer's proprietary MusicCast multiroom system. It also boasts plenty of other features, including Hi-Res Audio support, and voice control via Amazon Alexa. At £599 it isn't cheap, especially when you consider that it doesn't support lossless audio or the Dolby Atmos or DTS:X immersive surround formats. However, Yamaha knows a thing or two about building soundbars, having practically invented the concept over the last decade. Does the brand deliver here? Yamaha has gone for a minimalist design for the soundbar: there's a curved metal grille along the front and a black brushed metal finish on the top. The build quality is good, and the unobtrusive appearance and low form-factor ensure the soundbar can fit in front of a TV without blocking the screen or drawing excess attention to itself. The simple design extends to the display, which is composed of a series of small lights located to the left-of-centre and at the rear of the top panel. These register which source you have selected: HDMI, ARC, Analogue, and Bluetooth/Net. There are also indicators to show if a surround mode has been selected, or if the soundbar is connected via Wi-Fi or Bluetooth. Inside the soundbar there are front left and right speakers, which are located at either end and are composed of two 1.8in woofers and a 1in tweeter. The separate active subwoofer is styled in black brushed metal to match the soundbar, and uses a side-firing 6.5in driver combined with a bass port at the front. The Yamaha MusicCast Bar 400 boasts a solid set of features, headlined by the inclusion of DTS Virtual:X. This is a '3D Surround' feature that uses psychoacoustic processing to create a more immersive experience from a 2.1-channel system. 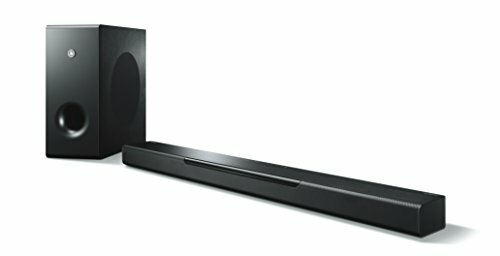 The soundbar supports lossy Dolby Digital, Dolby Pro Logic II, and DTS Digital Surround, but not lossless formats like Dolby TrueHD and DTS-HD Master Audio, which means no immersive object-based surround from Dolby Atmos and DTS:X.
MusicCast is obviously a key feature, and it works really well. You can create a network comprised of all the MusicCast-supporting devices you have, and then stream music to and from them, allowing you to run a full multi-room system. In addition the most popular streaming services are built-in, giving you direct access to Spotify, Deezer, Tidal, and Qobuz. One final benefit of MusicCast is that you can add add wireless surrounds, using either the MusicCast 20 or 50 speakers, to create a 4.1-channel system. There's also the Clear Voice feature that makes dialogue easier to understand, and if you own an Amazon Alexa product, you can also control the Yamaha with voice commands. The Yamaha Bar 400 houses all its connections in a recessed area at the underside of the soundbar. Here you'll find a single HDMI input and an HDMI output that supports ARC (Audio Return Channel). They both support 4K/60p, Wide Colour Gamut, High Dynamic Range (HDR10, Hybrid Log-Gamma and Dolby Vision), and HDCP 2.2. There's also an optical digital audio input, a 3.5mm analogue audio input, and a LAN port for a wired Ethernet connection. In terms of wireless connections, you have a choice of WiFi (2.4GHz/5GHz) or Bluetooth (Ver. 4.2+EDR/A2DP, AVRCP), along with support for Apple AirPlay. Just to the right of the indicator lights on the top of the soundbar, there are a few simple touch-sensitive controls for source select, mute, volume up/down, and also power/connect. The included remote is a bit small and fiddly, but at least it's intuitively laid out and includes all the controls you'll need. Using the remote you can adjust the volume and subwoofer level, select inputs, and choose features like 3D Surround and Clear Voice. Since the Bar 400 includes support for MusicCast, you can also use the app, which works very effectively and has a well-designed user interface. It's certainly the best option for setting up and controlling the Yamaha, considering the lack of an informative display on the actual soundbar itself. Setting up the Yamaha MusicCast Bar 400 is simple: pop it in front of your TV, position the subwoofer towards the front on the room, then sort out your sources. Since the Bar 400 doesn't support lossless audio, you may as well connect them to your TV and then send the audio back to the soundbar via ARC. You can connect one source directly to Yamaha using the HDMI input if you like, but you won't get any audible benefits over simply using ARC. MusicCast means you can stream music from your home network, other devices, and the various music services that are already built-in. If you want the soundbar to work with my Alexa Echo, the MusicCast app will take you through the process, but you will need to create a Yamaha account. Amazon Alexa voice control does work, but it is dependant on phrasing the commands correctly, which can sometimes be frustrating. You might find that simply grabbing the remote or using the app is quicker and easier. Yamaha's years of experience really shows, with the MusicCast Bar 400 proving to be a solid performer for both movies and music. It might not support lossless audio, but given it's a 2.1-channel system that doesn't really make much difference, and there a number of surround modes to help expand the audio beyond basic two-channel. The Bar 400 proves very capable for TV shows, especially those with less complex sound designs. The 2.1-channel configuration allows for decent stereo separation, resulting in precise imaging and good localisation with effects and music across the front. Despite the absence of a centre speaker, dialogue sounds clear. If you feel that dialogue needs further enhancing, perhaps on some dramatic mumblethon, then Clear Voice feature can be very useful. Moving on to more demanding soundtracks, such as TV dramas like Iron Fist or a movie like Avengers: Infinity War, and the performance remains good, but ultimately rather limited by the inherently 2.1-channel nature of the system itself. However, thanks to the 200W of built-in amplification, the sound can go loud without becoming strained or fatiguing. Despite the system's obvious limitations, an interesting mix like that in The Matrix sounds very dynamic, with aggressive steering of effects and plenty of movement across the front two speakers. The subwoofer is also effective, adding plenty of low-end presence. There are a number of surround options available, each of which is designed to deliver a specific experience: Music, TV programme, Movie, Sport, and Game. In testing none of these modes were especially effective, sounding flat and echoey rather than actually adding a sensation of surround presence. However, if you engage the '3D Surround' option, which is the DTS Virtual:X processing, the results are a lot more successful. This mode creates a greater sense of three-dimensional space and sounds feel as if they are emanating from within the room. This sense of depth is significantly more obvious than when listening to the Yamaha in 2.1-channel mode, and as such we would prefer to use this mode with movies and TV dramas. However, the sense of immersion isn't as good as it is with the processing on the Sony HT-ZF9. The Yamaha MusicCast Bar 400 is a well-put-together little soundbar that delivers a solid 2.1-channel performance with both movies and music. The inclusion of MusicCast is very useful, with an effective remote app combined with the ability to stream music or create a multiroom system. There's even the option to add rear channels using MusicCast speakers. The inclusion of Hi-Res Audio support adds to the soundbar's audio capabilities, while features such as Clear Voice and Amazon Alexa are also nice additions. The main DTS Virtual:X feature also creates a more immersive experience from 2.1-channel audio. Sadly a lack of lossless support, and only one HDMI input are disappointing at this price point. The Bar 400 isn't cheap, although if you're on a limited budget there is the option to buy the Bar 40 for £399 instead. It's the same soundbar but doesn't include the wireless subwoofer. Sony's soundbar also uses digital signal processing to create a virtual immersive experience. The fact that the ZF9 supports both Dolby Atmos and DTS:X is a big advantage, though, plus it offer stwo HDMI inputs. It's a bit pricier, but this 3.1-channel soundbar is hard to beat.